TubeMate app for android is the best app to download YouTube videos in your android device. Tubemate enables a quick and fast downloading of videos that can be directly saved in your Android. Tubemate can be helpful to download from many other video sites such as dailymoton, Facebook and any site that contains videos. You can also get as many download in a day without paying even a single cent because this app is completely free but it shows ads on the bottom. Ads shouldn’t a big issue for anyone because this is the way most of the developers make money these days in android world. You can download videos in many resolutions or formats as your choice. You can store downloaded videos to your sd card directly or your phone storage. Choice is yours. You can download videos from any site such as YouTube, dailymotion etc. Fast download mode allows you to increase your download speed by a significant range. Download apk file of tubemate from link below. Install it. If this is your first time that you downloaded app from other sources than google play, you have to allow “installation from unknown sources” in your android device setting. Open tubemate. It will open YouTube automatically. 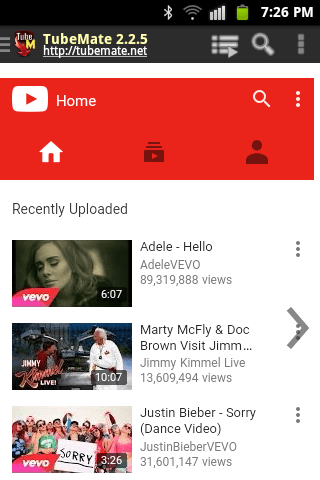 Search for the videos you want on YouTube and Tap on any video you want. Now click on the green arrow pointing downwards and it will say “parsing video information”. Then you will be shown a lot of resolutions such as 1280×720, 640×360 etc. Most common resolution is 640×360. You can download higher or lower quality of video depending on your device. To download videos from other website click on Top left corner of tubemate and click on any site you want on the side menu. Click Here to download Tubemate Apk for android. Good article! keep it up!! Yap! Tubemate is really an awesome app! But it seems, there is given an old version. You can check here the tubemate latest version also can update your Content. By the By, Thanks for sharing the content! Tubemate is a very effective app to download youtube videos. 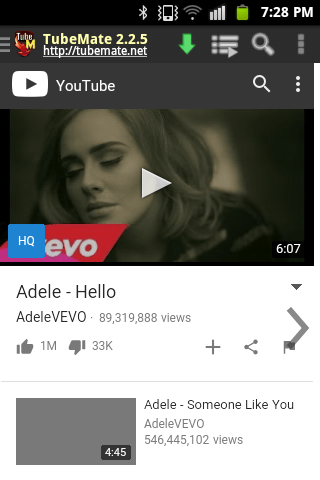 I find another video and music downloader app called SnapTube which can download YouTube video as mp3 format. no converter needed.